Researchers found the magnitude of the moon's very slight wobble, as it orbits Saturn, can only be accounted for if its outer ice shell is not frozen solid to its interior, meaning a global ocean must be present. The finding implies the fine spray of water vapor, icy particles and simple organic molecules Cassini has observed coming from fractures near the moon's south pole is being fed by this vast liquid water reservoir. The research is presented in a paper published online this week in the journal Icarus. 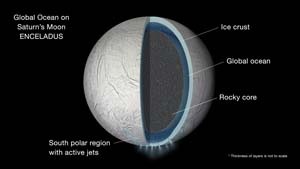 Previous analysis of Cassini data suggested the presence of a lens-shaped body of water, or sea, underlying the moon's south polar region. However, gravity data collected during the spacecraft's several close passes over the south polar region lent support to the possibility the sea might be global. The new results -- derived using an independent line of evidence based on Cassini's images -- confirm this to be the case. "This was a hard problem that required years of observations, and calculations involving a diverse collection of disciplines, but we are confident we finally got it right," said Peter Thomas, a Cassini imaging team member at Cornell University, Ithaca, New York, and lead author of the paper. Cassini scientists analyzed more than seven years' worth of images of Enceladus taken by the spacecraft, which has been orbiting Saturn since mid-2004. They carefully mapped the positions of features on Enceladus -- mostly craters -- across hundreds of images, in order to measure changes in the moon's rotation with extreme precision. As a result, they found Enceladus has a tiny, but measurable wobble as it orbits Saturn. Because the icy moon is not perfectly spherical -- and because it goes slightly faster and slower during different portions of its orbit around Saturn -- the giant planet subtly rocks Enceladus back and forth as it rotates. "If the surface and core were rigidly connected, the core would provide so much dead weight the wobble would be far smaller than we observe it to be," said Matthew Tiscareno, a Cassini participating scientist at the SETI Institute, Mountain View, California, and a co-author of the paper. "This proves that there must be a global layer of liquid separating the surface from the core," he said. The mechanisms that might have prevented Enceladus' ocean from freezing remain a mystery. Thomas and colleagues suggest a few ideas for future study that might help resolve the question, including the surprising possibility that tidal forces due to Saturn's gravity could be generating much more heat within Enceladus than previously thought. "This is a major step beyond what we understood about this moon before, and it demonstrates the kind of deep-dive discoveries we can make with long-lived orbiter missions to other planets," said co-author Carolyn Porco, Cassini imaging team lead at Space Science Institute (SSI), Boulder, Colorado, and visiting scholar at the University of California, Berkeley. "Cassini has been exemplary in this regard." The unfolding story of Enceladus has been one of the great triumphs of Cassini's long mission at Saturn. Scientists first detected signs of the moon's icy plume in early 2005, and followed up with a series of discoveries about the material gushing from warm fractures near its south pole. They announced strong evidence for a regional sea in 2014, and more recently, in 2015, they shared results that suggest hydrothermal activity is taking place on the ocean floor. Cassini is scheduled to make a close flyby of Enceladus on Oct. 28, in the mission's deepest-ever dive through the moon's active plume of icy material. The spacecraft will pass a mere 30 miles (49 kilometers) above the moon's surface. For more information about Cassini visit http://ciclops.org, http://saturn.jpl.nasa.gov and http://www.nasa.gov/cassini.